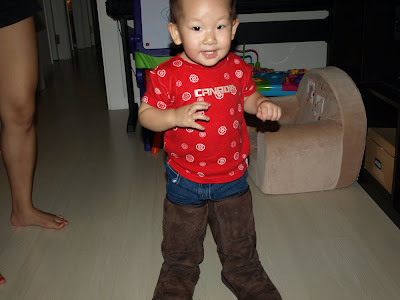 Our friend Katie came by the house the other day and took off her warm, fuzzy and comfortable suede boots. Natalie stumbled upon them and wanted to put them on. So we helped her into them. They were "low" boots on Katie (under the knee) but covered Natalie's entire legs. She stomped around the house in them for a while and refused to take them off. See how happy Natalie is with "her" new boots. Whoa, they're a little hard to walk in. Natalie reaches a hand up to hold Katie's hand for support. Here she is walking around with Katie. 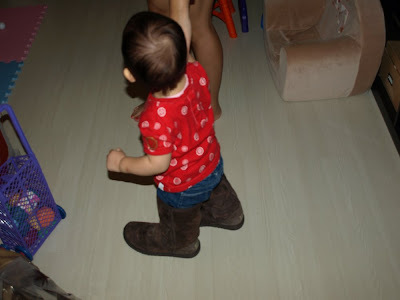 The boots are almost half her height. You can barely see her jeans any more. 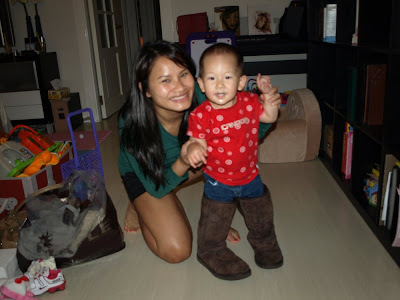 Natalie posing with Katie and her boots. She was very cheerful and happy. Katie was awesome with her. 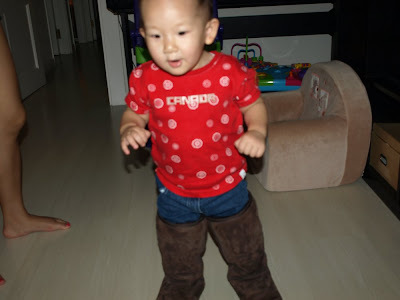 When we took the boots off, Natalie started crying and demanded we put them back on. 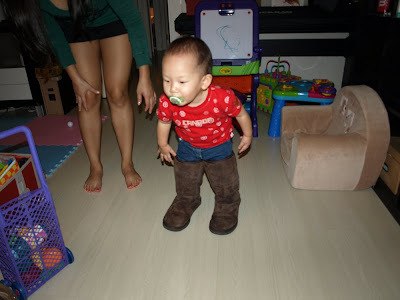 We also gave her the pacifier and she kept playing in her new boots. You should make a collection of all her shoe pictures! You've also got ones of her in high heels right? LOL!